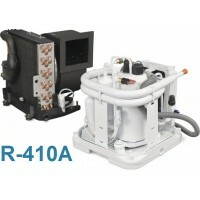 R-410A Refrigerant Units	There are 30 products. Dometic Condensing Units and Evaporators that use R410A Refrigerant - Dometic Emerald (DEU) Series Condensing Units and TurboVap (TVE) Evaporators. 115V or 230V. Wide range of cooling capacities. For R417A Systems, see here. The Dometic Emerald DEU48 condenser has reversing valve, pressure switches, and service ports centrally located for easy maintenance access from any side. Vibration-isolating compressor mounting system reduces noise and vibration. Pair this with a Dometic Emerald TurboVap R-410A evaporator. 2-year warranty*. 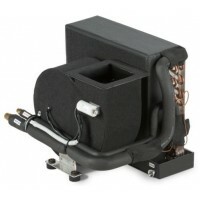 Dometic TVE16 Emerald Series TurboVap Evaporator Unit, 16,000 BTUs, R410A, 50-60Hz, 230V. 2-year warranty*. MFG: 215613500.